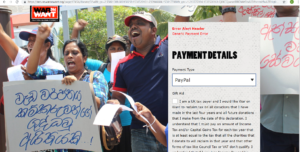 Paypal has stopped providing services to the UK Charity War on Want. This follows UK Lawyers for Israel (UKLFI) pointing out to Paypal that War on Want appeared to have close links to a terrorist organisation, the Popular Front for the Liberation of Palestine (PFLP). Paypal was one of the payment methods offered to the public on War on Want’s “make a donation” page. However, if anyone tries to donate using Paypal now, they are met with an error message. Thanks to NGO Monitor for their information on Addameer. The PFLP is an active terrorist organisation. It is one of the Terrorist Entities listed as an “asset freeze target” under the heading “terrorism and terror financing entities” by the UK Government in its latest Guidance note, updated on 2 August 2018.The US Department of State Bureau of Counter Terrorism lists the PFLP as a Foreign Terrorist Organisation, and designated it as such on 10 August 1997. Atrocities for which the PFLP has claimed responsibility include: an attack on those praying at a synagogue in West Jerusalem on 18 November 2014, in which five Jewish worshippers and a Druze policeman were murdered and six other worshippers were injured, with axes, knives, and a gun; and a drive-by shooting of passengers in a car on 29 June 2015, injuring four Israelis, one of whom died the following day. Addameer describes itself as a “Prisoner Support and Human Rights Association”. It is an official affiliate of the PFLP. Abdullatif Ghaith, Chair of Addameer, was described by Miftah (another Palestinian NGO) as a representative of the PFLP. He was banned from entering the West Bank from 2011 to 2015 due to Israel’s security concerns. Khalida Jarrar, Addameer’s Vice Chair, is also a senior PFLP official and is described by PFLP’s website as its leader. She was convicted in December 2015 of various offences including active membership of the PFLP (a terrorist organization) and inciting violence through a call to kidnap Israeli soldiers to be used as bargaining chips for the release of Palestinian prisoners. She was released from prison on 3 June 2016 but was re-arrested and placed in administrative detention in July 2017 for being a senior member of the PFLP. Ayman Nasser, Addameer’s legal co-ordinator, was indicted and remanded in custody for being an active member of the PFLP and providing funds to it. The remand was upheld by the Court of Appeals in December 2012. Sumoud Saadat, Addameer’s field researcher, is the daughter of PFLP General Secretary, Ahmad Saadat. He is currently serving a prison sentence in Israel, having been convicted in 2008 by an Israeli military court for heading an illegal terrorist organization. On 23 February 2017 Anas Barghouthi, a lawyer for Addameer, signed a plea bargain to avoid prison in relation to his alleged membership of the PFLP. In December 2016 War on Want launched a project, together with Addameer, called “Political Prisoners’ Stories.” This is one of War on Want’s main campaigns and implements the PFLP’s strategy of “using human rights forums” to promote a “national struggle”. The campaign is also thoroughly misleading and promotes racial hatred as described in section 4 below. War on Want also supported Addameer’s action to promote a boycott of G4S, which supplied services and equipment to Israeli prisons. In February 2016 War on Want arranged for Addameer’s director Sahar Francis to speak around the UK. It has been reported that War on Want spent more than £1,000 to bring Sahar Francis to the UK for this purpose.